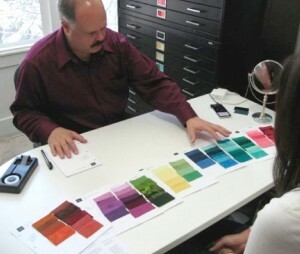 The Munsell System of Color has been used by our company Personal Style Counselors since our founding nearly 50 years ago. 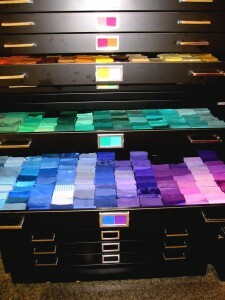 We have always embraced this marvelous System as we believe that Munsell is based on how the human eye perceives color. It shows up everywhere at PSC. 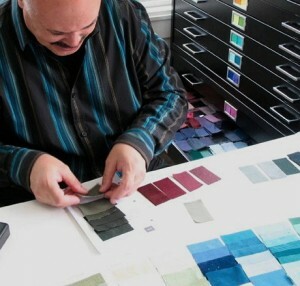 Munsell Color is in all 3000 color fabrics we use. Our yardage has a basic hue notation designating the hue of that particular color whether the color is 2.5, 5, 7.5 or 10. It also shows up throughout our training manual. To be a personal color and style consultant at PSC you must first have a BA in Art then be willing to become an apprentice. During that extensive training period, you’ll use the PSC training manual which describes how colors and skin tones are correlated to the Munsell System. Additionally, in our cosmetics, particularly the custom blend foundation program, a liquid foundation is mixed under daylight to accurately duplicate a client’s skin tone. The numerous foundation bottles are labeled according to the Munsell System and may include a spectrum of bottles containing liquid versions 7.5 PB 5/4 to 5YR 7/3. Historically, California artist Ron Sackman came on board at PSC in 1971. 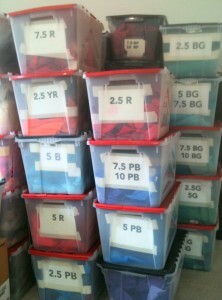 Under Ron’s guidance, the PSC inventory of fabrics was expanded from 1500 to 3000 samples. 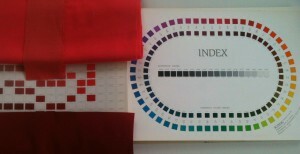 This library of fabrics would give Ron and all future consultants a vast array of precise matches, so that each personal spectrum would be entirely unique for each client. In this expanded inventory, Ron also Munsell-coded every fabric and later would create the PSC training manual based on the Munsell System. For example, one of the most universally wearable colors is red. In Ron’s training manual it would precisely describe where a particular skin tone’s reds would start and stop based on Munsell. Some clients with cooler complexions would have reds starting in 10RP and ending in 2.5R. Some skin tones with more balanced coolness and warmth would start at 2.5R and go into 5R. Whereas warmer skin might start at 5R but would go as far as 7.5. With Ron’s keen insight and having the Munsell System as an integral tool, a trainee and future consultant would see patterns in human coloring and the Munsell system became an invaluable aid for this understanding. 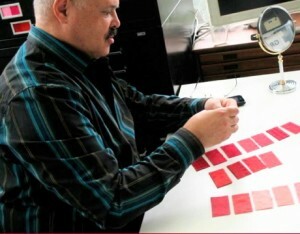 In these photographs are Ron Sackman, the PSC color fabric file and the matching of fabrics checked against the fabric edition of the Munsell System. In future entries, I’ll show and describe PSC’s custom blended foundation program. Color is truly magical. Our spirits soar when we see the flash of the Northern Lights or a rainbow. Color lifts our consciousness and from that experience all is peaceful. 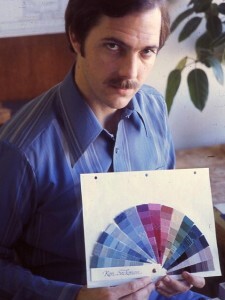 And the Munsell System of Color is an invaluable aid to understanding this depth of color. John Kitchener, Director of PSC for men and women since 1964. My life-dedication and purpose is to make a planetary difference by empowering each person to see themselves as Harmony.